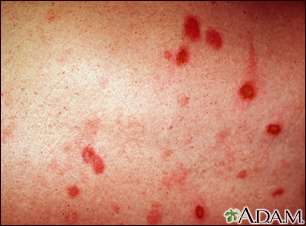 Erythema multiforme (EM) is an acute skin reaction that comes from an infection or another trigger. EM is a self-limiting disease. This means it usually resolves on its own without treatment. EM occurs mostly in adults 20 to 40 years old. People with EM may have family members who have had EM as well. Good hygiene may help prevent secondary infections (infections that occur from treating the first infection). Use of sunscreen, protective clothing, and avoiding excessive exposure to sun may prevent the recurrence of EM. Holland KE, Soung PJ. 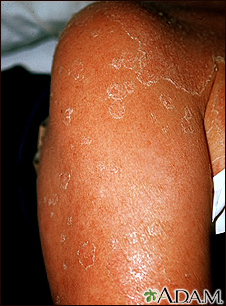 Acquired rashes in the older child. In: Kleigman RM, Lye PS, Bordini BJ, Toth H, Basel D, eds. Nelson Pediatric Symptom-Based Diagnosis. Philadelphia, PA: Elsevier; 2018:chap 48. Shah KN. Urticaria and erythema multiforme. In: Long SS, Prober CG, Fischer M, eds. Principles and Practice of Pediatric Infectious Diseases. 5th ed. Philadelphia, PA: Elsevier; 2018:chap 72. 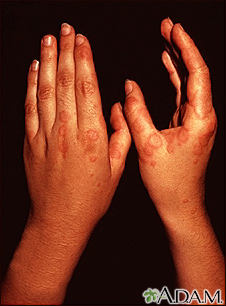 Erythema multiforme lesions are often referred to as target lesions because of the concentric rings the lesions produce. The target appearance is well demonstrated in this photograph. 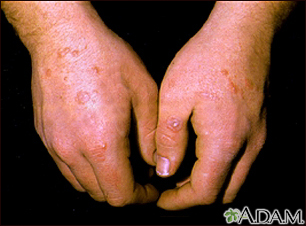 This individual has erythema multiforme minor, with target lesions on his hands. 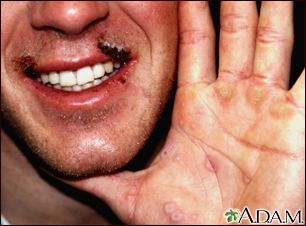 His condition may result from a recurrent herpes simplex virus infection on the lip. This picture shows diffuse redness (erythema) and scaling on the arm.